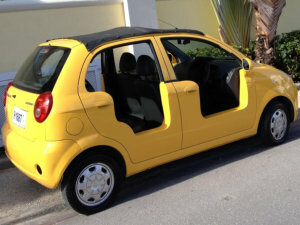 Soft Top No Doors: Bajan Air Con! Are there any extra insurance charges? No, your quotation INCLUDES full insurance. If I Have an accident or the car is damaged in ANY way, What do I have to pay? Are there any additional Taxes Added? No, your quotation INCLUDES all Taxes. Do I need to make advance payment? No, payment is made in full at time of rental. Payment MUST be in US$ cash. Please note: we do not accept credit cards for on-line special rates. What are the driver requirements? Is there a charge if I cancel my booking? No: we trust you will advise us in a timely manner. Is there a charge for an additional driver? When we say 'All inclusive' It means EXACTLY that. Our competitors routinely SAY this then later introduce local taxes, additional Insurance charges, CDW, You pay the first $.. in the event of an accident DON'T BE FOOLED! We have many hundreds of customers trusting us with their Moke rental / Moke hire requirements when visiting Barbados Please grant us the opportunity to earn your trust: we are confident of success! Barbados is 166 square miles. For such a small island, it boasts hundreds of miles in paved roads. Some are quality highways with dual carriageways, others less grand. One thing is certain: Barbados is an island surrounded completely by beautiful coral sand beaches. To experience Barbados, car hire or car rental is highly desirable.